This recipe is 1 of five that I created to go with the Batch Cooked Ground Beef. If you haven’t checked that out – it’s seriously only 3 ingredients, and an easy way to prep a protein. Once you cook & season beef, there are so many recipes you can make with it! I like to store several ounces of the beef in the refrigerator for the next two days, and then the rest goes into the freezer! …in 1 or 2 cup portions. The beautiful thing is, once you’ve prepped a protein, you can scale it to meet the needs of just you…or your family. Freeze it accordingly! …whether in larger portions, or individual. 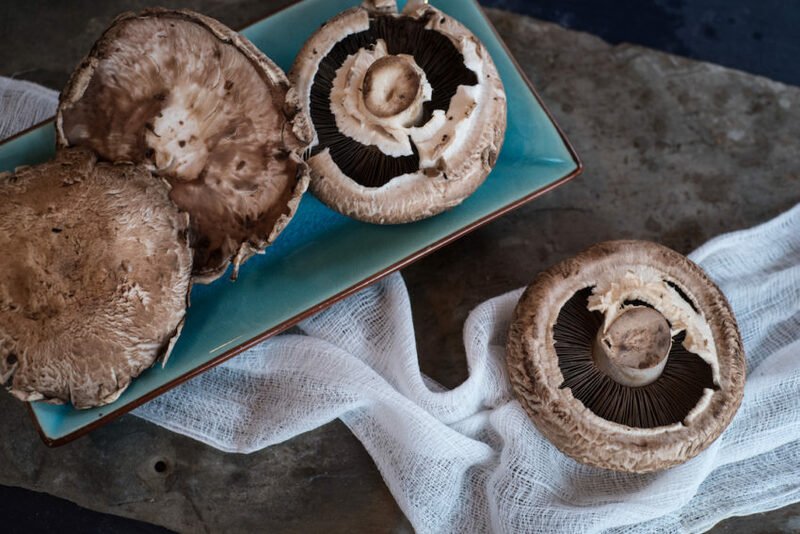 Portobello mushrooms are one of the perfect holders for protein. They are hearty tasting and have that delicious “umami” (savory) flavor. 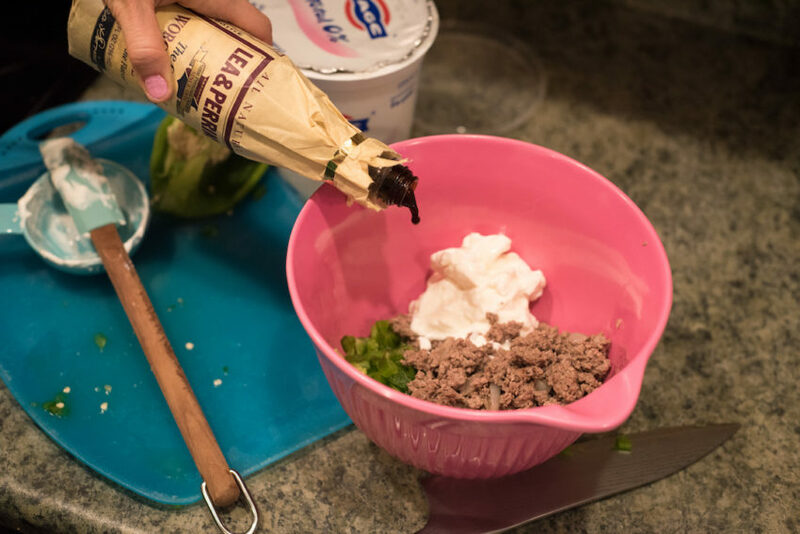 Mix with our pre-cooked ground beef (and feel the glorious momentum of having that accomplished already ;), green bell pepper, a generous splash of Worcestershire (yum), sprinkle kosher salt, and, 0% FAGE Greek yogurt. This stuff is smooth, creamy, high-protein, and I think is the ultimate swap for sour cream. I have never had anyone question it (given that they don’t see it go into the recipe). It’s amazing delicious and so much more healthier. Only 11 grams of carbohydrate, 2 grams fiber, and 25 grams protein each! That’s a win in my book. 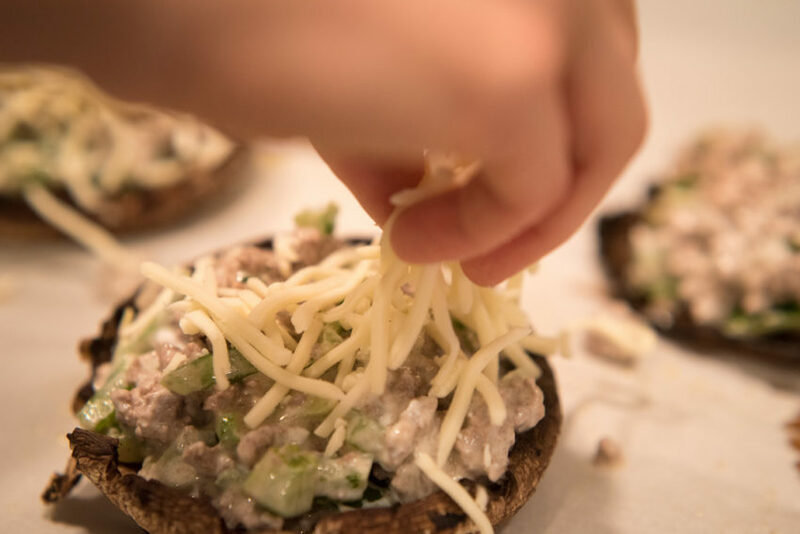 And…everyone at cooking class loved them! Whew? I created this recipe for Albertsons Safeway ? 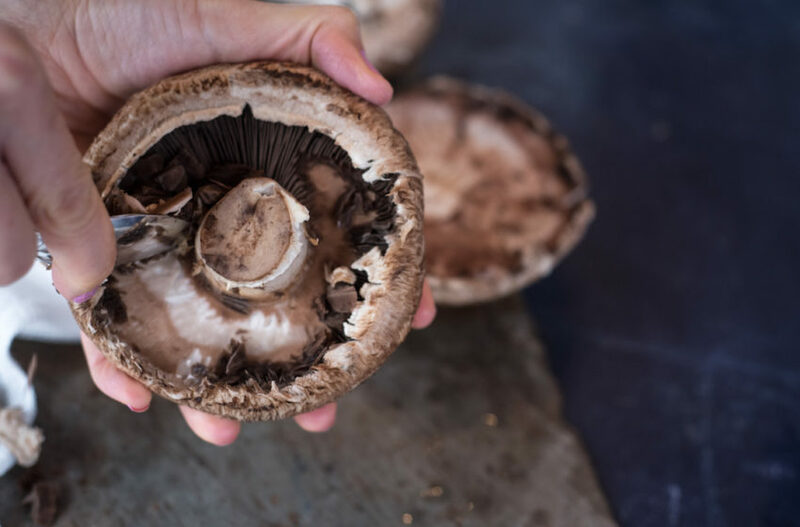 PS – people usually either love or hate mushrooms. If you’re a hater (no judgements passed), use this same technique with a bell pepper, cut in half and seeds removed. Or, a zucchini sliced lengthwise and the middle scooped out would work beautifully too! 1. Preheat oven to 375º. 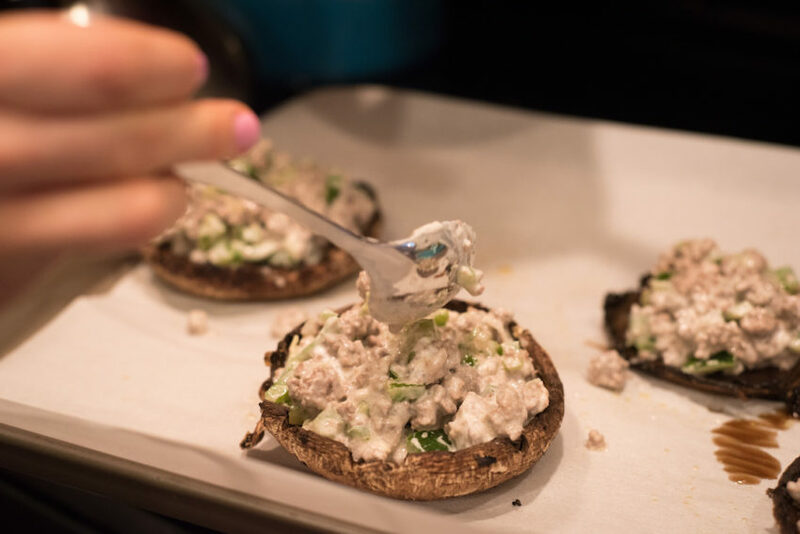 Spray mushroom with nonstick cooking spray and sprinkle with a little kosher salt, then place on rimmed baking sheet. Bake for 5-10 minutes. 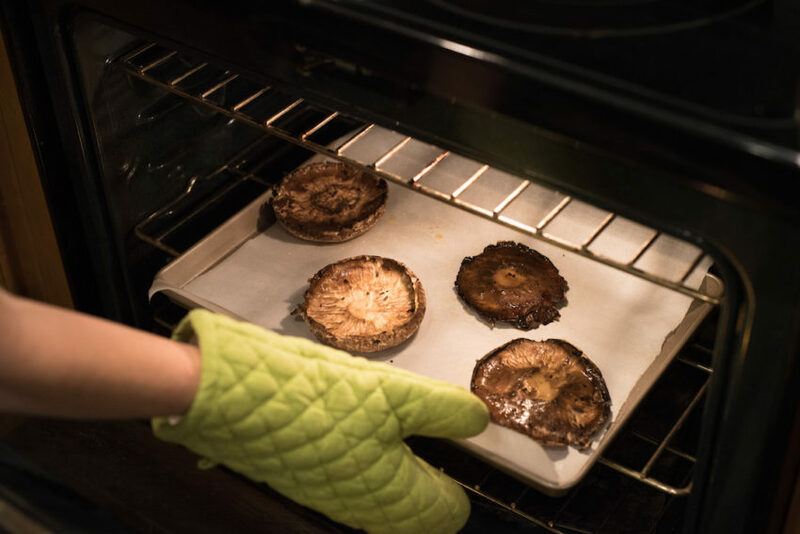 If the baking sheet has a lot of juice from the mushrooms, dab it up with a paper towel. 2. 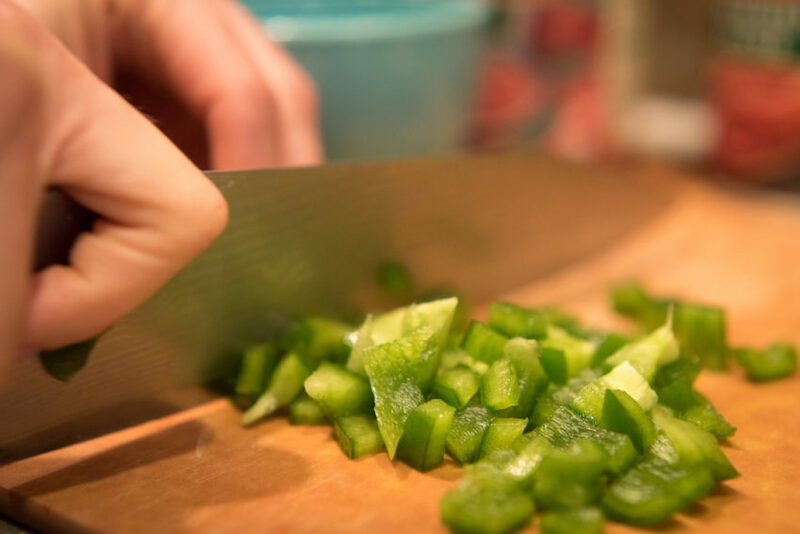 In a mixing bowl, combine bell pepper, ground beef, Worcestershire sauce, yogurt, and salt. Fold until everything is evenly mixed. 3. Scoop 1/2 cup of mixture to each mushroom. Top each with 2 tablespoons of mozzarella. Cover with loosely with aluminum foil and return to oven for 10 minutes (by the way, to keep the foil from sticking to the cheese, give the underside of the foil a light spritz of cooking spray!) Remove the foil and bake additional 10 minutes. Serve immediately! 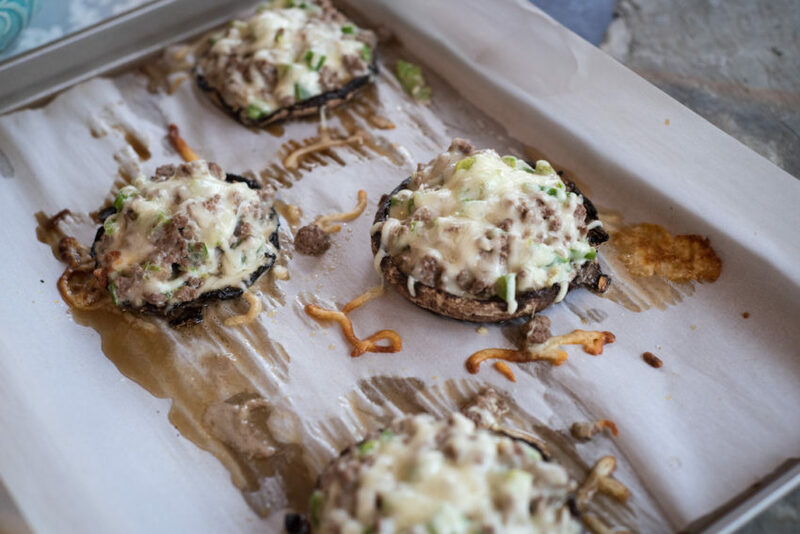 – the hamburger mixture would also be great as a topping on spaghetti squash, or as a filling for zucchini or bell peppers. Not everyone *loves* Portobellos! – don’t forget: spray the aluminum foil with nonstick spray to avoid any risk of the cheese sticking to the foil. We want it on the stuffing! Not stuck to the foil?